Here at Lockaway Storage, we know our success is due to our wonderful team. The care they give our renters is unparalleled and we want to highlight their milestones along the way. 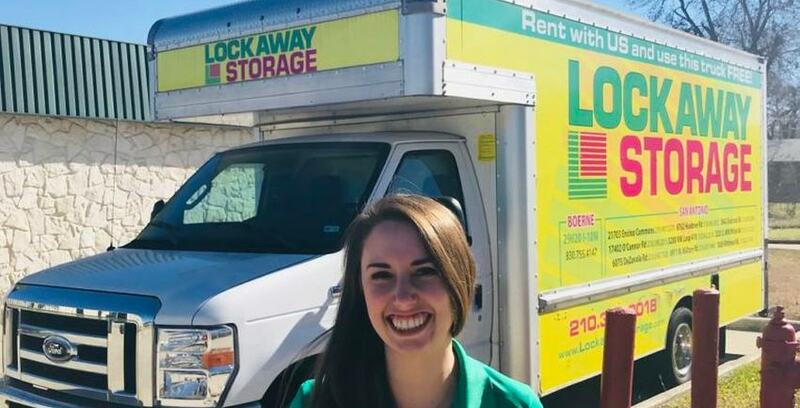 Below is an interview with San Antonio team member Ashley Montessoro, who is celebrating her 8-year anniversary with Lockaway Storage. Ashley Montessoro is the Executive Administrator for Lockaway Storage in San Antonio and Texarkana, Texas. She worked her way up from Assistant Manager, to Manager, to District Manager, and beyond! Ashley is the Executive Administrator for Lockaway Storage and lives in San Antonio. Peter: Ashley, holy cow! Has it been 8 years? How did you get started with Lockaway Storage? Ashley: So, by the middle of the month, it will be 8 years. I kind of fell into working with Lockaway. I had just graduated college. I had just moved down to San Antonio and needed a job, but wasn’t really sure what I wanted to do. I knew Tristina, our VP, already and she said she had a part-time position open that would really help her out, so I met her and Don for about fifteen minutes in a Starbucks in Boerne and they hired me and I started out part-time, two days a week, now it’s been 8 years. Don made me guarantee him a year as part of the hiring process and I have definitely lived up to my end of the bargain, haha! Peter: I’d say so. He pretty much got an 800% return on his investment. Peter: Haha, so you are kind of unique in that you worked your way up from assistant manager to a member of the executive team. What was it like to work your way up during the last 8 years? Ashley: Oh yeah, I talk about it a lot during the hiring process, especially when someone asks about the opportunity for growth within the company. I think my story is a perfect example of how you can grow within the company. Like I said, I started out as an assistant manager two days a week. The manager at my store ended up leaving shortly after I was hired, so I took on that store and became the manager there. I would approach Tristina and ask for more projects and ask her if there was anything she needed help with, so I started to do more and more for her. They saw what I was good at and it kind of evolved into a kind of Assistant District Manager position. Then, once our company grew a little bit more and as she needed more help, I became a District Manager. Then we grew even more and I became a Regional Manager. While I was Regional Manager, I had a lot of conversation with Don and Tristina and Danielle about my strengths and what I really enjoyed doing, so we talked about a different type of position. They actually created the position I’m in now for me. They’re really good about looking at what you’re good at they tend to create positions for people. Like Jason with his education position, it’s something he’s passionate about and really good at. The stuff I’m really passionate about is stuff the people on my team, the District Managers, hate doing: scheduling, the tiny, behind the scenes minutiae, stuff in Sitelink. I really like that nitty-gritty, behind the scenes standardization stuff. I really enjoy that. This year, it’s even evolved more. I’m doing more with HR, more filing. It’s stuff that I enjoy, but not a lot of other people enjoy. They really play to our strengths. Don and Tristina really see that, so that’s how my position grew and became what it is. It was something that didn’t exist before and they saw the need and they saw that I could fill it and that’s really cool. Peter: Without getting into the sausage-making of it too much, if you had to succinctly describe your position to someone, how would you describe it? Ashley: Hahaha, well, I wear a lot of different hats just like everyone else at the company. One of the main things I do is hiring, so I am the hiring manager for the whole company. I do a lot of HR paperwork and filing. I do a lot of stuff for Tristina too, kind of the catch-all. If there’s something affecting our whole San Antonio team: logistics, organization, those sorts of things. Peter: So, basically operations things? Ashley: Yeah, it’s all operational and it’s all behind the scenes stuff. I actually just got a job description and I have been in this position for over a year. I do things for self storage and I do stuff for HR, and I oversee Texarkana. I do a lot of different things. It’s really a catch-all kind of position, because I do stuff across the board for different VPs. I do stuff for marketing. I oversee our email and do some training related to payroll. Peter: Wow, you really do a little bit of everything. A modern day renaissance woman over here! Ashley: Haha, yeah, I have my fingers in a lot of different parts and most people don’t realize what I do, because it’s such a different position. Peter: These are all things that are essential for a company to not only run well, but to grow. You guys have experienced a lot of growth lately. You’ve been there the whole time and experienced it. What’s that been like? Ashley: It’s so weird, haha. I always like to think about my orientation, which happened at least twelve months after I was hired. There were 8 of us, I think, and they took us out to dinner and we sat around the same table. We chatted about the company and the culture, which obviously we knew about at that point, but we used to have our team meetings inside of the Huebener office. That office is not that big and our whole San Antonio team used to sit in there with two folding tables. Now we have to rent out a room at the holiday in fits over 60 people. In the early days, the Lockaway Storage team met at the location on Huebener Road. Now, the company has to rent a conference room when they want to have a full team meeting. Peter: That is so wild. Ashley: It is crazy just how much has changed. We had 7 properties in Texas when I started and now we have 35 just in Texas alone. We didn’t have VPs and now we have multiple VPs. We didn’t have a payroll manager. Now we have a payroll manager. We have somebody specifically in charge of business development. I think that’s crazy and awesome. We didn’t have a President, which is one of our newer changes. We’ve just grown so much and the coolest part is that it has grown a lot without becoming too corporate. We have a home office and all that stuff, but we still have that small company feel. Our CEO still knows everybody by name. He does such a good job with that. He remembers their kids’ names. I am terrible about that stuff, but it’s something that trickles down through our company. It’s such a hometown feeling in our company and I really enjoy it. I’m glad we haven’t lost that, even though we’ve grown so much. Peter: Would you mind speaking more about that hometown company culture feel that Lockaway has? Ashley: I always tell people that if it wasn’t for Don and Tristina, I wouldn’t still be with this company, because they’ve created such an atmosphere and environment. You know, selling a 10×10 in self-storage is selling a 10×10 in self storage. It’s just an empty box. It’s not the most exciting thing. I said that once to Don and he was like, “Oh! It’s super exciting and invigorating. You don’t know!”, but it’s something you could do for so many companies, but there aren’t many companies that are going to treat people the way they treat us. We really, all 155 of us, really lucked out working here. Don, now, he wouldn’t take credit for our company culture. He cares so much and I think it’s stemmed down from him. He said at a meeting once, “As team members, we have our customers. We have people who come into our office every day and it’s our job to take care of them. But he considers us his customers. It’s his job to take care of us. He wants to make sure we’re taken care of, we feel safe and we’re doing what we want to be doing at our properties. I think that’s the perfect example. There aren’t many CEOs who are going to know the names of people who are part-timers two days a week, but he does. He knows their names. He probably knows their kids’ names. He probably remembers that their kid was going to star in the Wizard of Oz and was really nervous about it and he’s going to ask about that the next time he sees them because he just cares. I’ve spent a lot of long car drives to Texarkana with him and we don’t always just talk about work. He wants to know what’s going on in my life and he really just wants to get to know me as a person. That’s something that you just don’t find. That show, “Undercover Boss” would never happen. He couldn’t get away with it if he tried and I don’t think he’d ever want to try. He wants to be a part of everybody’s day-to-day work and environment at their facilities and he wants them to know he’s available and he’s there. Everybody has his cell phone number and if you call he will pick up. It’s really clear in our company, we have a lot of people who have come from different self storage companies and they all say that we are just run differently. A lot of team members have had hard times and Don has done things for them or had conversations with them and it’s really touching because it shows that he really does care. Everybody knows that he’s there for them. Peter: Wow, I was not expecting that answer when I asked about the company culture. Ashley: I talk a lot about it during the hiring process, so I have my back-pocket stories. It’s something that’s really important to me that people understand what they’re getting into when they come to work for our company because we run differently. You either drink the Kool-Aid or you don’t and I am a full-on Kool-Aid drinker. I can’t imagine working for anybody else besides Don and Tristina and they have really created something here that is awesome. Peter: One of the things I have been thinking about lately is that it’s incredible that they’ve built this company culture, but we can’t overlook how it wouldn’t exist if it didn’t work from a business perspective. Something happens when people “drink the Kool-Aid” and really care about their job and care about doing it well. That goes into how good the service is and how good the product ends up being as a result. You’ve really lived this working as an Assistant Self Storage Manager, Manager, District Manager, etc., and now you’re working from more of a top-level to grow this culture. Would you mind speaking to how “drinking the Kool-Aid” can help better the customer’s experience? Ashley: When I was a manager, they really tried to instill in us the mindset that we first need to help our customers. Customers are going through a hard time. Most customers are storing during the worst times in their lives: divorces, moving, death. It’s not an exciting time and we’re kind of like their bartender, just without the alcohol. I’ve heard so many stories. I’ve had so many people crying in my office because they needed to talk to somebody. In a lot of other companies, you aren’t able to sit down and have these conversations and really take care of people and our company allows us to do that. If somebody’s having a hard time, we’re able to reach out to them, to help them do things, give them a break one month if they need it and a lot of bigger companies won’t let you do that. They’re very strict on certain things. Obviously, we’re still going to run our business and we’re still going to take care of our properties and there are still budgets that we’re going to maintain and we’re given all those tools, but we’re also allowed to be human and that’s really nice. We don’t have an exact script that we have to follow every day. We don’t have something that has to be said every time we talk to the customer. They give us the freedom to speak to people and relate to the customer, which I think is really important. That’s why people come back. That’s why people store with us. It’s about the person sitting behind the counter. I mean, I still go by the property I managed for four and a half years and people see my car and they come up to me and say, “Oh! You’re here! Are you coming back?” and I have to tell them that no, I just came by to drop something off. It’s an interesting thing to be the person behind the counter. You learn some really personal stuff about people and you can kind of be there for them in a way that other people can’t. They may tell you things that they wouldn’t tell their best friend because you’re a stranger. You’re just the person they pay rent to every month, so it’s nice to be that bartender, that support, that therapist for them. Peter: That is a good way to put it. Do you have any go-to stories from your time in self storage? Ashley: I had this woman who stored with me and she had a 5×5, so a small unit. It was $30 a month and she had been storing with us for several years by the time I got to the property. I worked at a facility that was older, so we had a lot of long-term customers. She would come in and I would tell her her amount and she would always be so flabbergasted that I would remember her name. We didn’t have long conversations. My favorite stories are honestly about the connections I have made. There’s a woman who works out of her unit at the Loop 410 store. She has a company and she’s one of the people who always runs in and says, “Hi” to me when I am there. It’s kind of like seeing your teacher outside of work. It’s weird. I guess I don’t have a super specific story though. Peter: No, no, that’s good. After 8 years there’s probably a lot of information that blends together when someone puts you on the spot like that. I think this is a good time to transition to another set of questions. So, you’re not always working in self storage. What is your life like outside of work? Do you have any hobbies? Ashley: I’m married, so my husband and I own our house and we have been doing some improvements to it. We have a pretty decent sized garden in our backyard. My husband brews beer as well and I’m also an artist, so I have a big studio set up in my house and I paint and I design jewelry. Ashley has been making jewelry for more than a decade. Nowadays, she mainly creates jewelry for close friends and family to mark special occasions. Peter: That’s great. Tell me some more about designing jewelry. That’s a pretty interesting hobby. Ashley: Well, I started when I was in high school. There was a jewelry design class at my high school that I took for two years and I kind of fell in love with it. That lead me to get my degree in it. I have my Bachelor of Fine Arts in metalsmithing and jewelry design. I don’t do it as much as I used to, but I do have a little bit of studio space set up. Recently I made a bracelet for my good girlfriend’s wedding. She’s getting married at the end of the month to my husband’s best friend. That was really fun, being able to make something personal. I made her a pair of earrings too. She asked me to make her something for her wedding day, so it was really exciting to be able to do that. When I got married, I made all of my bridesmaids’ earrings as well. Peter: So, it sounds like nowadays, this hobby of yours allows you to create really meaningful gifts for the special people in your life? Ashley: It does! I also sew a lot, so I’ve gotten really into doing that and giving handmade gifts to a lot of friends recently. Peter: Those types of gifts are always my favorite. Ashley: That’s what I did all day Sunday while my husband was out at his ranch. Hahaha. Peter: Hahaha. That’s not a bad way to spend a Sunday: inside, hanging out with the dog, doing some sewing, making some jewelry, having some coffee. Peter: Nice, nice. You guys live in the San Antonio area, right? Ashley: Right, we live in the middle of the city. Peter: Do you guys have a favorite restaurant in your neighborhood? Ashley: In our neighborhood? We live in a pretty chain-ish kind of area. Kind of suburban. There are a couple of restaurants that we go to regularly just because they’re close. We may be lazy on a Thursday and not feel like cooking. My favorite restaurants are a ways from us in South Town, King William or The Pearl area. I always like to try weird, new things and my husband tolerates it. Peter: What’s a weird, new thing you’ve tried recently? Ashley: Well, it’s not really weird per se, but me and some girlfriends were at Supper in Hotel Emma at The Pearl and we got to try some of their really good food. That place is just beautiful and has some really, really good food. Delicious salt and vinegar fried brussel sprouts. So. Good. Peter: What are some of your favorite things to do in San Antonio? Any regular haunts? Ashley: We’re pretty lazy homebodies, so we stay at home a lot and hang out with our close friends a lot, generally at one of our houses. I’m in a book club that meets once a month on Wednesday nights. Our meeting is actually this week and I haven’t read the book yet, so…uhh! We don’t go out and do too, too terribly much. I really like the farmer’s market at The Pearl, but my husband thinks it’s too crowded, so he doesn’t like going. We drive out to Bandera, because his family has a ranch out there, so we drive out there occasionally. We like spending time in our house. We have a dog and we have a cat, so I always feel bad if we’re gone too long. We really want to be with them. My husband also just bought a Jeep that he’s rebuilding, so he likes to spend a lot of time in the garage right now. Peter: Right on. That sounds awesome to me. You know, I’m not one for going out a lot either, so that sounds really nice. Is there anything that I haven’t asked about yet that you want people to know? Ashley: I don’t think so? It’s so corny, but I just want people to know how much I love this company. I’m really happy to be here, to be working with everybody, even when they drive me crazy. I really like everybody that I work with. Peter: At the end of these, I like to ask if there’s anybody at the company that has helped you out in the past and deserves a shout out. Would you like to give anyone a shoutout? Ashley: I really enjoy working with everybody in the company and I work closely with the San Antonio DM team and some of the upper management in California, but I’m going to go ahead and give my shout out to the Texarkana team, so Christy, Donal, Lauren, Ann and Brittany, Andrew and Tia. I really enjoy getting to spend time with them. They have created such an amazing atmosphere. It’s such a strong team. They all get along so well. You can tell that they like working together when they’re in the same room. They’re all joking. It doesn’t seem like anybody’s the odd man out. They’ve just created such a wonderful atmosphere out there, so I think that they definitely deserve that shoutout.